Fifteen years to the very day, Hellboy debuted in theaters and an audience's love for a red-skinned son of Satan was born. Well, at least for those that hadn't already discovered Hellboy in comic book form. Hellboy was a departure of sorts as it followed by Spawn and Blade as non-traditional comic book characters that found a receptive audience on celluloid. Sure, everyone knew that Batman and Spider-Man and Superman would find an audience on the big screen as they all had rather large followings among comic book readers, but these independent, periphery characters were charting new territory. I would argue that the trails that they blazed emboldened Marvel to branch out from their main rogues' gallery and to take a chance on something such as Guardians of the Galaxy. And we all know how that turned out. So, with a new live-action Hellboy set to open in theaters next week, it only makes sense that Lionsgate would take the opportunity to re-release the older Hellboy stuff and ride the new film's coattails a bit. Of course, Lionsgate only has the rights to the animated films Sword of Storms and Blood & Iron. Sony which owns the rights Hellboy opted not to release it on 4K UHD (yet) and Universal which owns the home entertainment rights to Hellboy II will wait until late May to release it on 4K UHD. 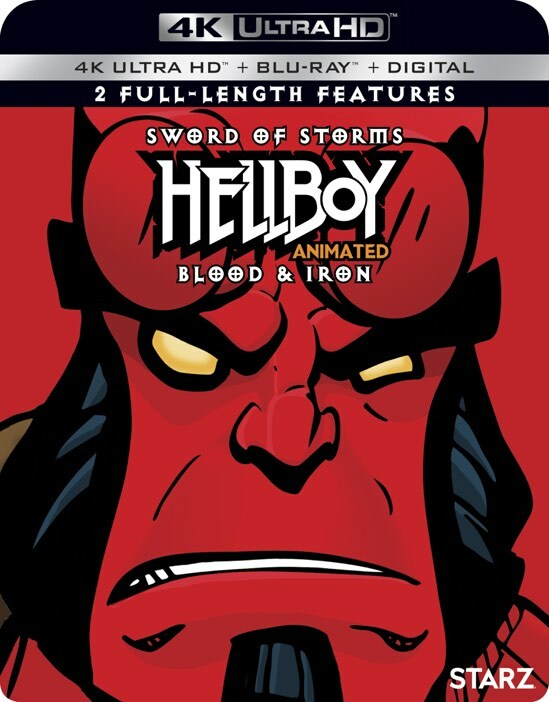 Hellboy: Sword of Storms / Blood & Iron is a collection that contains the two animated films that were released between the two live-action movies and features the same actors voicing their animated counterparts. So yes, that means we get more Ron Perlman, Selma Blair and Doug Jones in their iconic roles. In Sword of Storms, a professor becomes possessed by the ancient Japanese demons of Thunder and Lightning. When the BPRD sends a team to investigate, Hellboy is sent to a supernatural dimension by a cursed samurai sword. Meanwhile, Blood & Iron follows Hellboy, Liz, and Abe as they investigate the ghost-infested mansion of a billionaire hellbent on resurrecting a beautiful yet monstrous vampire from Professor Bruttenholm's past. With the new incarnation of Hellboy hitting theaters with David Harbour in the lead role, it was nice to check back in with the Ron Perlman version. In many ways, I felt that the animated Hellboy films captured the spirit of the comic book better in a way that I think was more in line with Guillermo del Toro's vision of the character. As I re-watched the films in glorious 4K, I was reminded just how amazing Ron Perlman was in the role and how big of shoes that David Harbour has to fill. By the looks of it though, it seems that David Harbour embraces the challenge and knocks it out of the park. I still had certain misgivings about the animation style chosen for these films though as it wasn't quite the look and feel of the live-action movies and a bit of a departure from Mike Mignola's original animation style. The color palette looks to be consistent with the comic books, but there's almost a slight animÃ© influence that is lacking in the books. That said, the original source material wasn't what you would call vibrant and the Dolby Vision transfer isn't noticeably different from the Blu-ray. In fact, there are some mistakes from the original animation that is magnified by the increase in resolution, but they aren't too terribly distracting. The Dolby Atmos audio mix is a nice touch, but again, the soundtrack doesn't seem to have been remixed. The result is a better use of channels, but overall the audio doesn't resonate as a properly mixed Dolby Atmos track is known to do. The main selling point, at least to me, of the new 4K UHD version is the introduction of a slew of special features that weren't previously available on either the DVDs or Blu-rays. These bonus features includes both featurettes and commentaries and are the true selling point of this new set. If you're even a casual Hellboy fan, these new features will certainly tickle your fancy. All in all, the quality uptick isn't necessarily one that would prompt me to upgrade my existing Blu-rays, but the added features are more than enough to make Hellboy: Sword of Storms / Blood & Iron a worthy 4K UHD purchase.